Hello there friends! I can't believe we're already moving into the last full month of summer, where has the time gone??? June seemed to go very quickly and I'm really not sure why, but here we are the weekend before the Fourth of July. 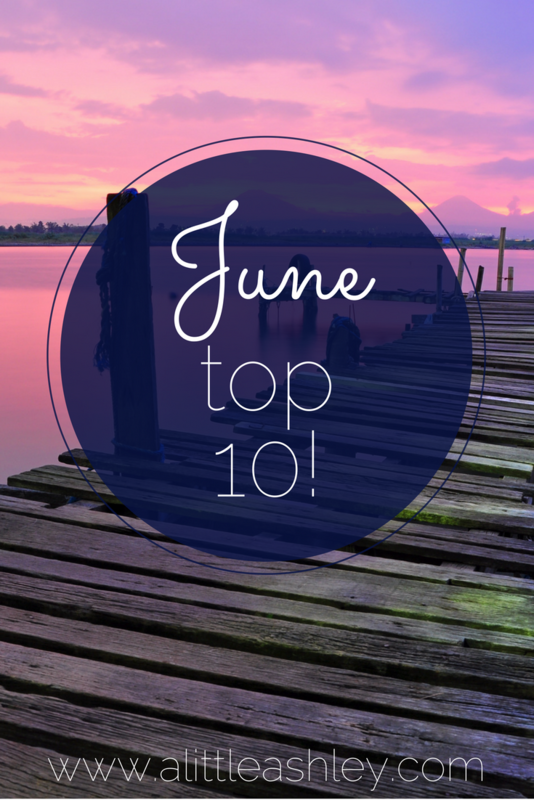 While June didn't have a whole lot going on, there were definitely some things I have loved during this month! 1 // At the start of the month, I got to spend a full week with my adorable boyfriend. We live the long distance life during the summer, so getting to spend uninterrupted time together this time of year is rare. We didn't have any big plans for the week, just soaking up time together before he left for ROTC training, but we had a good time together. I'm looking forward to him coming back from training in less than 2 weeks (!!!) and we're planning to fit in a couple day trips before he goes back to South Carolina. 2 // With all the free time I've had since Mike left, I've been trying to read a little more. I picked up Uninvited by Lysa TerKeurst at the end of May, but really dove into it this month. Y'all! Everyone needs to read this book. The message is so unbelievably powerful and it really resonated with me and some of the things I've gone through in the past year. The book is centered around dealing with rejection - whether from friends, a boy, jobs, etc - by finding peace in the promises God has for you. It's an extremely moving book and I think it really helped me take a step towards moving on from past hurts, highly recommend! 3 // My other free time has also been spent watching Netflix, not the most productive, but hey, it's summer time. I prefer to find some sort of sitcom to have as background noise while I'm doing other things and lately that has been That 70's Show. Just a forewarning, it's rather inappropriate. But it's very funny and easy to have playing without having to pay full attention. I've gone through it faster than anticipated (oops), so if you have any recommendations of fun, lighthearted shows to watch, let me know. 4 // I did some shopping this month because I just can't resist a good Old Navy sale. So far, I've only worn a couple of the things I bought, but I think I have a new favorite item of clothing. A black, t shirt, swing dress. Now I'm not a girl who wears black, ever. I'm convinced I'm too pale to wear it. But I bought this black dress because it seems like a good basic to have, and now I want it in every color available! It's so comfy and you look super put together, even though you're really just wearing glorified pjs. So it's pretty much the best thing ever. And it's on sale right now for $15!!!! Some of the other swing dresses are as low as $8! I'm really having to resist the temptation to buy them all. 5 // Summertime is always when I find new bloggers and social media accounts to follow. This summer, I found another Clemson blogger! And there will be another blogger coming in as a freshman in the fall, we have discussed a blogger brunch and I'm all about it. But seriously, Elizabeth's blog - Life of Me, Queen B. - is so relatable! Her outfit posts are always adorable and I love how she shares her faith on her blog. Go check her out! 6 // As for me, all has been rather quiet on the blogging front. It's so easy to get caught in the comparison trap! I constantly think, "well why should I bother writing anything when there are probably a million other things like this out there written by people who are professional bloggers?" That is not a good mindset to have! It seems like so many people in this blog bubble are in it to eventually make money, and sure that would be nice, but that's not what I'm about. This blog has always been my passion project and I've spent some time really reflecting on that and thinking about why I started this blog and brainstorming ideas for my little corner of the internet. Self reflection is always a good idea and I need to do it more often. 7 // I've been writing more this summer, just not here lol. But with Mike being off at army training, letters have been an important form of communication. Y'all it is so much fun to write and receive letters. Everything these days is digital and instant, but knowing there's a handwritten note coming in the mail for you is so exciting. We've exchanged quite a few letters at this point and I know they're something I'll always keep - I also always keep everything, but that's beside the point. I've also been writing in some journals and just putting ideas on paper. It's unbelievably therapeutic and something I should really do more often. Do you have a pen pal you write to? 8 // Summer for me is all about country music! Blasting country jams with the windows down in a car with friends is the most stereotypical summer image in my mind. I've also spent most summers going to country concerts with friends. I took some time putting together a playlist of my favorite summer country jams on Spotify - it has a little bit of Texas Red Dirt country, some new pop-country, and some old classics. Am I missing any good summer songs? 9 // I've also been doing a lot of online browsing in search of the perfect outfit for my birthday at the end of July!!! And the great thing about social media (there definitely quite a few downsides) is that it is so easy to discover small businesses. Since I'm from a tiny town, I tend to have soft spot for small, local businesses. There are tons of adorable online boutiques that have great selections of trendy clothing at really reasonable prices. The newest boutique I've discovered is Hazel and Olive, which is actually based out of Texas. I haven't ordered anything from them yet, but I might soon! This gingham romper would be perfect for the 4th. And this palm print one would be great for your next beach trip. 10 // I am so excited for July to begin! It's definitely my favorite month of the year, probably because it's my birth month. But this year it will be especially good since we'll be starting off with lots of 4th of July (my favorite holiday) festivities, the next week Mike will be back and we're planning some fun summer adventures. And then I'll end July at the beach celebrating my 21st birthday with my family. What are your plans for the upcoming month? Love your playlist! I'm convinced black works for me solely because I'm pale---will have to check out that dress!